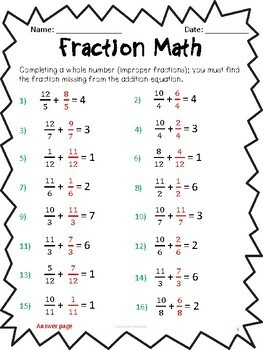 These completing a whole number (adding improper fractions) fraction worksheets have been designed to help aid your teaching of fractions. Ideal for grade 4 but can be used for higher achievers in grade 3 or as a revisit/interventions with higher graders. Each fraction worksheet (5 in total) has 16 completing a whole number (adding improper fractions) fractions in it. Answer pages are also included. Making it easier to grade for teachers and students. What can these fraction adding mixed number worksheets be used for? 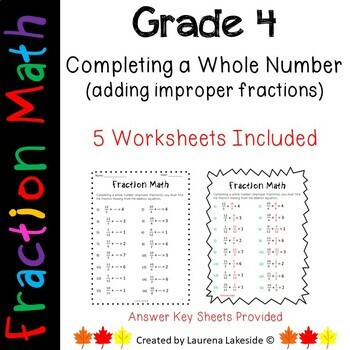 These grade 4 fraction worksheets can be used for many purposes. The idea being that they are used alongside your math fraction lessons. Your students will need to know how to simplify some of the fractions. Homework – Just print these out and they are ready for you to send home! Have them in your supply folder for quick access – Always handy for those just in case moments! Please note: Watermarks/blurred images will not be in your downloaded file! All files are PDF unless stated otherwise.